Thank you, Alan. This is a far too derided film. Too much was made of Sophia's performance and people are too willing to overlook how good it it because it isn't its predecessors. I've always felt the same way as you about this film. One good thing may have come from the thrashing it and Sophia too at the time of its release, however. Sophia has become one of the best directors of her generation. That may have been worth people telling her she stunk as an actress. The story was over at the end of Godfather II. There is simply no reason for this picture to exist. I would have preferred such a mediocre rehash to have been presided over by a hack if it had to be done at all since frankly, it feels like the work of a, well ... uh, hack. The story of The Godfather was over at the end of The Godfather. The two stories of the Godfather II were over at the end of The Godfather II. I don't see what is wrong with adding a third (fourth) story to the series. yeah, calling F.F. Coppola a hack in this film does nothing for your creds. There are a great many memorable and well done moments in this film that are upper-echelon film making. Unfortunately, the more average moments are forced to compete with the GF legacy. it's a no-win. but, it was an admirable effort, nonetheless. and definitely in that year's Top 5.
i've always thought a shorter version may have benefited and helped separate 3 from 1&2. 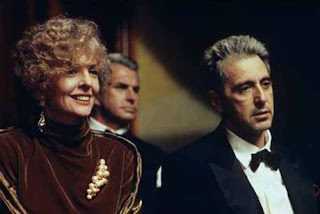 it seems the attempt to fit it into the 3 hour epic mold of the previous films may have allowed Coppola to over-extend. perhaps a more restrained, meditative, and personal 2:15 version could have improved the overall product. First, to Mr. Wells - some stories are worth telling, other are not. More importantly, some stories reach a natural conclusion, while others are stretched interminably to the detriment of the original source material. GFIII falls squarely in the latter category. For years, GF and GFII stood, not as separate movies, but one epic father-son story set against the backdrop of crime in America. The final images of GFII haunted me and many others for years until GFIII spewed onto the silver screen with its mind-numbing mediocrity and Pacino's ridiculous haircut. Is there anything wrong with this? No, but only if GFIII had a sliver of the integrity of Hamlet 2. But alas, GFIII has no laughs. Hamlet 2 does. GFIII has occasional flourishes - the kind one would expect from Mr. Coppola. Sadly, though, the picture is a dud. Also, I may have been hasty in attaching a negative connotation to the word "hack". Some of my favourite filmmakers are hacks. So allow me to revise my statement slightly and suggest that GFIII might have been palatable under the helm of someone like Jack Hill or Larry Cohen or, for that matter, Joel Schumacher. To Mr. Bacchus: Thanks for the head the other night. I'll be sure to extend the appropriate reach-around.